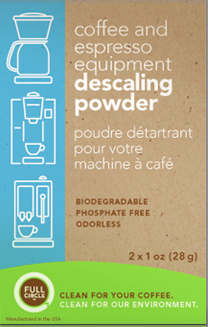 Full Circle Descaling Powder cleans the mysterious inner-workings of your coffee and espresso making devices. Why descale? Descalers are designed to break down the lime scale and mineral build-up inside your brewer to ensure great, consistent, coffee and espresso shots. The first line of defense is to use fresh filtered water. Then follow up with a descale regimen once every 3-4 months depending on usage. At a minimum try to work descaling into your schedule every three months.